Recently, Junpiter Futbol has concluded its visit to the Thai Premier League with the humble objective of visiting and understanding the football clubs and their academies achieved. Our first stop – Chonburi FC. Upon our arrival at the busy Suvarnabhumi Airport in Bangkok, Chonburi FC’s van, decorated with their famous Sharks’ logo stickers, greeted us and brought us to Chonburi Stadium that was approximately 90mins ride from the Airport. Welcoming us at Chonburi Stadium were Vice President of the Club, Mr. Thanasak Suraprasert, Thailand football legend/Technical Director of Chonburi Football Academy, Mr. Withaya Laohakul and Chonburi FC’s Joe Patit. Pleasure was certainly ours to meet up with the club’s Officials and discussed about Thai Premier League as well as topics on youth football development at the club. The 2007 Thai Premier League Champion was established in year 1997 as a province team. 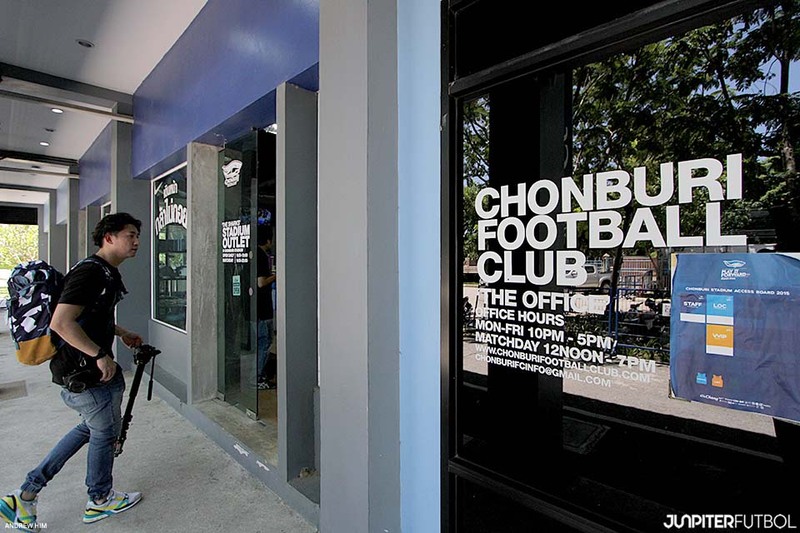 With big ambition for the club formed, the path and approach to professionalize Chonburi FC was spearheaded by 4 founders, Mr. Thanasak, Mr. Annop, Mr. Sonthay and Mr. Vidaya Kunplome. The four of them, who were also classmates from the same High School, took much effort to lead the club to flourish into a highly reputable football club not only in Thailand, but also in Asia over the years. Among some of the major names donning their jerseys previously were Worrawoot Srimaka, Natthaphong Samana, Adul Lahso, the Sukha brothers (Suree & Surat) and evergreen midfielder, 41yrs old Therdsak Chaiman who is still currently playing an important role in the club. 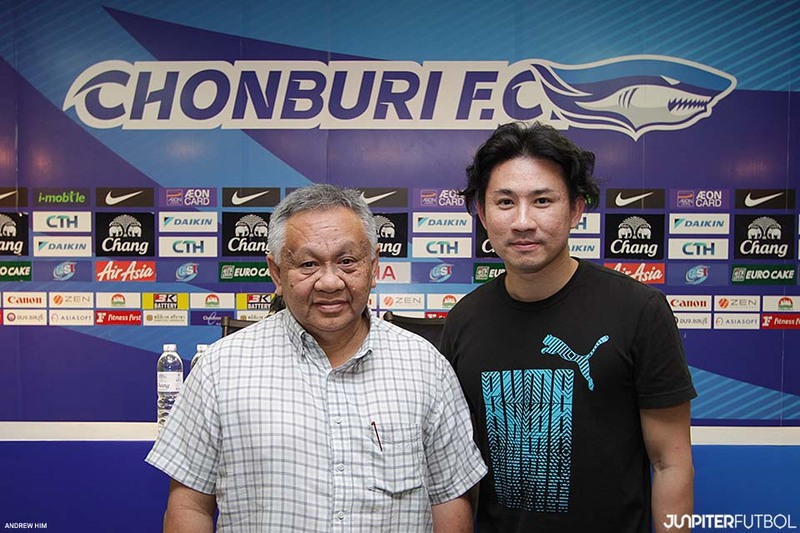 Although the Stadium belongs to the Chonburi province, the Mayor has been extremely kind and supportive in what Chonburi FC aspires to achieve. 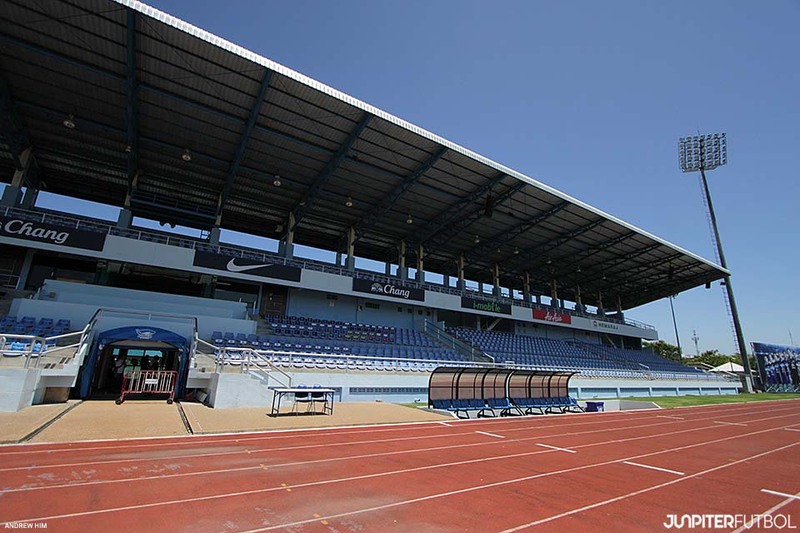 For overseas visitors like us, Chonburi FC and its Stadium could be just another club and facility. But once after having Joe walked us down the history of Chonburi FC’s, our impression of the club and its Stadium changed. We have convinced ourselves that we are looking at a piece of history and achievement which are crafted out by passion and the love for the beautiful game. Catching up with former S.League/current Chonburi FC’s evergreen Midfielder, Therdsak Chaiman. 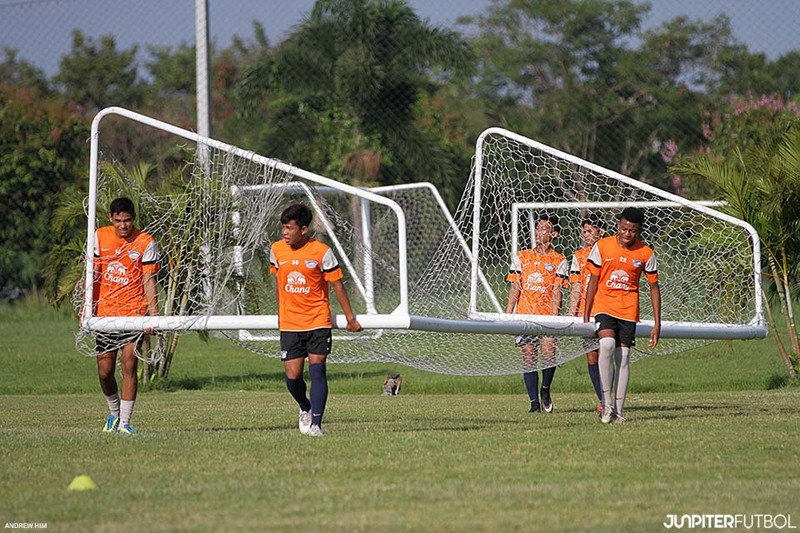 After acknowledging good players were hard to be come by or purchased, that was when a 8-years youth football development plan was born in Chonburi. It is a development plan created by the club in 2009 to ensure the club continue to enjoy the success which they are indulging in at the moment. Part of the players-developing plans is to ensure 5% of the Football Academy players progress to first team and 1% to Europe which the club has been following well thus far. Chonburi province has a sports colleague in which several sports’ elites are housed and trained. Football certainly does have its presence and office there too. For this trip, we were extremely lucky to be able to walk around the premises and even interacted with some of the local coaches in which we had been enlightened on all aspects such as their training facilities & players management. The Ban Bueong district-based Football Academy of Chonburi’s is about another 30-45mins ride from the main Stadium. To reach the Academy from the main road, it will take another good 10-15mins of ride through a thick vegetation. On a second thought, there isn’t any activity that could distract the players at all at the vicinity making it easier for them to concentrate on their training. 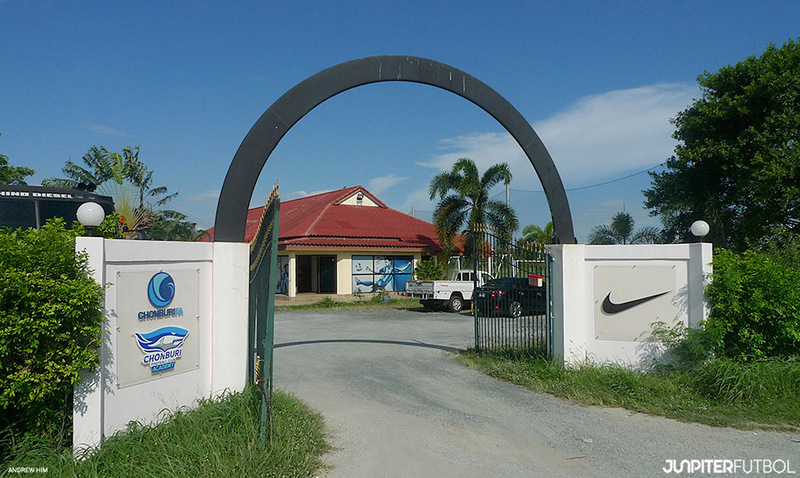 When we finally arrived at Chonburi Football Academy, the first impression we had that set us thinking was the condition of the Academy. The simple single-story building looked old but the infrastructure greeted us was nothing short of impressive. Beside the standard dormitory arrangement, there were proper changing rooms, laundry rooms, a decent size swimming pool, an open-concept gym for some weight trainings, a lounge equipped with Television and Wifi, and an extremely well-maintained 11-aside football training pitch. The Academy might not be that sophisticated as compared to some of the other football academies which we have visited previously, Chonburi Football Academy does not shortchange any future talents’ needs. For a place where all the future talents eat, sleep and play football, it is more than sufficient. All of the players will be picked up immediately after school and head straight to the Academy for training. We happened to be there at the Academy where a group of young players just finished their schools and were brought to the Academy. You couldn’t doubt their passion as you could see that all of them were eager to jump onto the pitch despite knowing there were overseas guests (us) moving around with cameras which probably was an unusual scene at their Academy. So another big plan is coming up for the Academy as the search and construction of a new Academy site is believed to be on its way. Junpiter Futbol hopes to be back then again! Phanthong FC, an affiliated division II club of Chonburi FC’s is also a great platform for the youth players coming through the rank. All 17yrs old from Chonburi Football Academy will represent the club in the Division II competition. Apart from participating in a season-long competition, all 17yrs old Phanthong FC players will also get to play in the Thaicom FA Cup and as well as the Toyota League Cup. By doing so, all the young players will be exposed to a much more higher level of football by playing against some of the bests in Thailand in both the FA Cup and League Cup. And not just exposure, they will gain maximum playing times and opportunities which are essential for their football development. Undoubtedly, this is an absolute wise football development plan by the Sharks. So how does the Football Academy know if their players are progressing in the right direction after so much effort and energy have been pumped into the 8 years plan? The answer is as clear as crystal when you have got 8 of your players forming the core team of the Thailand U-16′s First XI participating in the AFC U-16 Championship! The great hospitality which we have received at Chonburi was probably one of the best in our years of football traveling. We would like to thank Chonburi FC for welcoming us with opened arms, we would like to thank Mr. Thanasak, Coach Withahya, Joe & Pimpika. Thank you for showing us Chonburi FC! Thank you SingaCup for the opportunity and thank you Puma Singapore for the apparels. More photos of Junpiter Futbol at Chonburi FC, Click Here. Read more about your next visit to Bangkok Glass FC, Click Here.